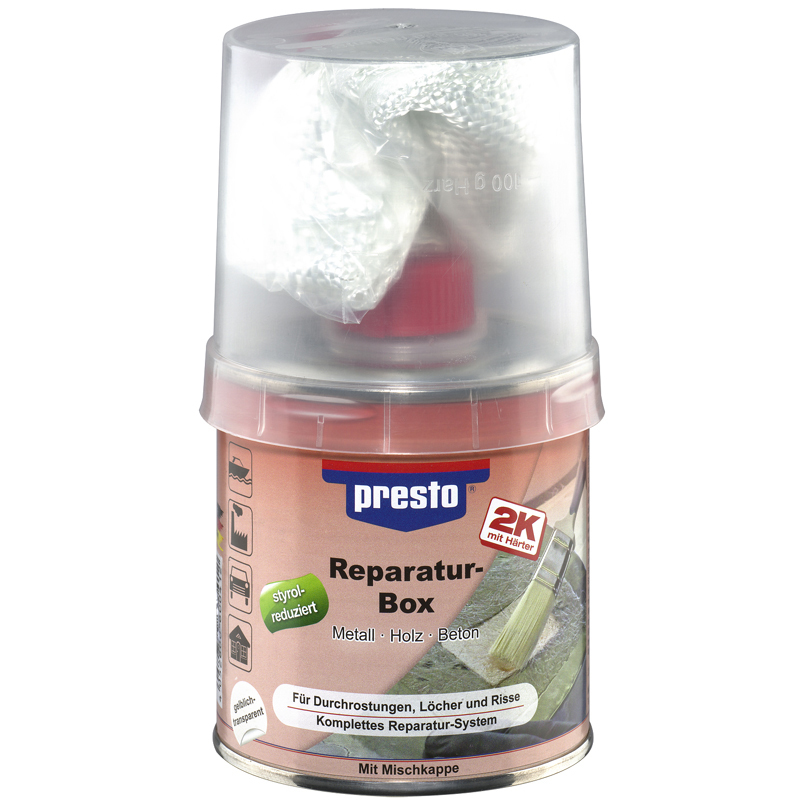 presto Repair Box contains unsaturated, elastified polyester resin, hardener as well as glassfibre fleece and glassfibre fabric. Suitable to bridge bigger holes, perforations from corrosion and damages in metal, wood, concrete etc. 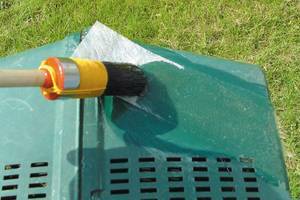 Especially applicable in mould and model building, in the garden (spray-fiber manufactured ponds) and in other industrial sectors. Can be used e.g. for leaking conductions and ductwork, tanks, boats etc. If you intend to paint afterwards, we recommend to apply presto Body Filler or presto Fine Filler after the use of the resin. Cut the glassfibre tissue depending on size of damaged area, calculate a sufficient overlapping. Brush some resin on the prepared surface and put the fibreglass material on this spot. 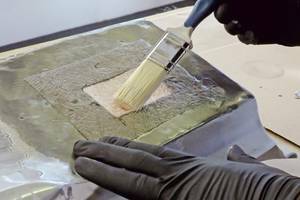 Press it with the help of a brush evenly onto the repair spot, starting at the edge, then soak it again with polyester resin. The glassfibre may have no air inclusions. As last layer you should apply and soak glassfibre fleece as a suitable coat for subsequent repair work. It is possible to proceed with several layers. If you wish to lacquer the surface, we recommend to go on with presto Body Filler or with presto Fine Filler. The surface of the polyester resin remains sticky and thus works as optimal adhesion promoter. If desired, you can wash off this sticky surface with nitro thinner. After approx. 40 minutes the repaired spot can be drilled, sanded, sawed, rasped and painted.